At the core of Our Solar Siblings is continuing research and evaluation of the success and failures of our approach. The core monitoring of the evaluation is through the use of two pre/post survey instruments undertaken by students in-class. The first instrument is a custom designed astronomy concept inventory instrument created in 2014 made up mainly of previously validated items from the a variety of well-tested concept inventories. There are also a small number of new items for conceptual areas previously untouched by prior instruments or specific to these materials. This survey is to probe to what extent students were learning the concepts behind the core content topics when they have engaged with Our Solar Siblings. The second instrument is also custom designed, taking core items from a well validated student perceptions of science instrument, a well-validated student experience of science questionnaire as well as some custom items specific for the Our Solar Siblings context. With this instrument we probe whether students shift in their attitudes and perceptions towards science when presented with the approaches in this project. These two instruments form the basics of our evaluation approach and allow us to get a broad feel for whether our approach is working in the classroom. To get a more detailed picture we also undertake more qualitative approaches including teacher and student interviews, co-teaching and observations as well as the use of video technology to examine the approaches in-class. There are a variety of publications related to Our Solar Siblings. Above: Colour Image of globular cluster NGC6101 with inset lightcurves of two of the variable stars studied and published by students. So far, there are two publications emerging from student astronomical research that are related to the curriculum materials used in Our Solar Siblings. 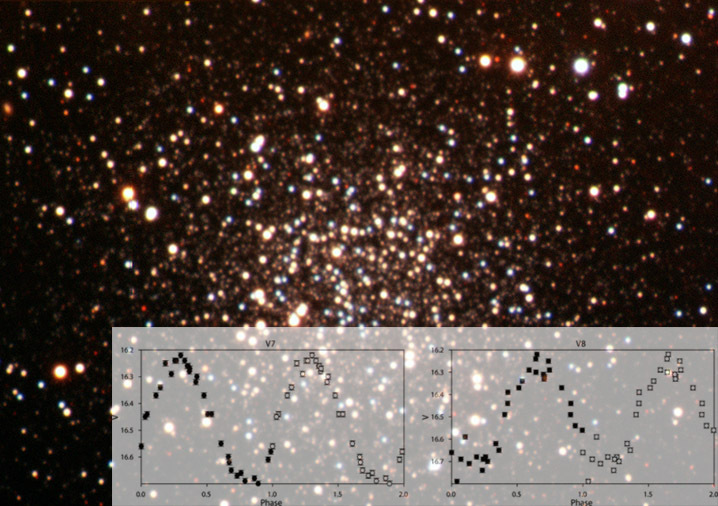 The first, a study of variable stars in a neglected far southern globular cluster, NGC6101, by two Year 11/12 students and their teacher was published in the Publications of the Astronomical Society of Australia, (2012), 29 (1), 72-77. The second, a study of a neglected open cluster, NGC2215 was published in the Astronomical Journal, (2015), 149:190 (arxiv version here) (OSS news story here). Further articles are at various stages of the writing and publication process. The broad design of the curriculum materials and approach is outlined in a paper called “Inquiry-Based Educational Design for Large-Scale High School Astronomy Projects Using Real Telescopes” in the Journal of Science Education and Technology in 2015. Results of student learning and change in perceptions of their science classes from an earlier project that utilised the curriculum materials is available in Research in Science Education. In 2017, a review article on “Robotic Telescopes in Education” also appeared in the Astronomical Review journal co-authored by an OSS team member. We have a number of conference publications coming out soon in the RTSRE 2017 Conference Proceedings. Preprints are available: Our Solar Siblings Overview Paper, Our Solar Siblings Pipeline Paper, A Brief Overview of Robotic Telescopes in the English Literature, Astronomy Research in the IB, Colour Imaging in Middle School and Robotic Telescopes in the OECD Curriculum.